A whole Crockpot Thanksgiving Dinner! 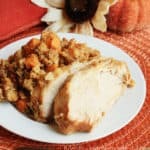 Boneless turkey breast slow cooks with sweet potatoes, carrots, celery and cornbread stuffing. The perfect, EASY way to enjoy Thanksgiving dinner with your family! Place thawed turkey breast in bottom of slow cooker (mine came with a netting holding it together that I removed, but you can leave the netting on - it keeps the turkey together while cooking). Add in the vegetables, top with dry stuffing mixes, and pour chicken broth over all ingredients. Cover and cook on low 7-8 hours or on high 4-5 hours or until turkey is cooked through. Remove stuffing & veggies to a serving bowl. Remove turkey to a platter, straining the juices into the slow cooker. Allow turkey to rest 5 minutes before slicing. Use reserved juices to moisten stuffing and turkey slices as needed.